Text prepared, introduced and annotated by Stéphane Schmitt, with the collaboration of Cédric Crémière. The thirteenth volume of Natural History, General and Special, the tenth of the series devoted to quadrupeds, appears in 1765. 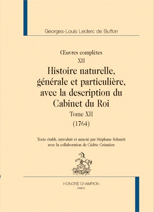 Like the preceding, it opens with a remarkable synthesis text, the second "View of Nature", in which Buffon recapitulates in a brilliant style some of his main scientific ideas, especially on the notions of species and equilibrium of nature, while introducing some bold innovations, for example concerning the origin of chemical affinities. . The rest of the volume, abundantly illustrated, deals with various animal species, mainly exotic, often poorly known in the eighteenth century (giraffe, llama), or totally new, to the point that Buffon is forced to introduce several neologisms to name them, like the "tarsier", the "coqualline" or the "ocelot". The volume ends with a long chapter on aquatic animals (seals, manatees ...), which form, according to Buffon, a sort of link between quadrupeds and cetaceans, denying the arbitrary classifications of systematicians. Stéphane Schmitt is research director at the CNRS (UMR 7219, Paris). His research focuses on the history of life sciences from the 18th to the 20th century, particularly on the development of anatomy and embryology in relation to the rise of the theories of evolution. Cédric Crémière, curator in chief of the inheritance and director of the Museum of Natural History of Le Havre, is particularly interested in the history of anatomy and collections.